PERRY--Dundee's varsity wrestling team competed at the sectional finals, Saturday, Feb. 2. Three wrestlers will be moving to the state qualifier after placing at the event. Kenneth Empson finished second at 170 pounds, falling to Mason Bush in the championship finals, 16-6. Leif Hoyt and Harry Nice both took fifth place with wins over Maddox Stirk and Ray Scheesley, respectively. The Dundee girls varsity basketball team topped Bloomfield, 64-55, Saturday, Feb. 2. Both teams traded the lead throughout the first three periods, but going into the final quarter, Bloomfield had a 46-40 advantage. In the fourth period, the Lady Scots scored 24 points to take the lead, 12 alone were scored by Mackenzie Strait. Overall, Strait netted 31 points, with four rebounds, four assists, and four steals. Makenzie Cratsley added 10 points and 14 rebounds. Hallie Knapp earned 10 points, with 11 rebounds. Megan Sutherland posted nine points, while Delaine Nolan had four points and seven rebounds. The Lady Scots won against Harley Allendale Columbia, 59-40, Friday, Feb. 1. Harley got within four points of Dundee's score with just five minutes left on the clock. Coach Michael Strait said, "That's as close as it would get as Dundee used great defense to pull away the rest of the game." Strait had 22 points, going 6-for-7 at the free-throw line. Cratsley netted 14 points, with 15 rebounds. Sutherland had 12 points and Knapp earned nine points with 11 rebounds. Alyssah Newell had two points and eight rebounds. Dundee's girls basketball team was beaten by Hammondsport, Tuesday, Jan. 29. The final score was 46-24. Strait scored six points, with three assists. Knapp and Sutherland both earned five points. Knapp also had six rebounds and five steals. Cratsley posted two points, eight rebounds, three assists, and three steals. Newell, Nolan, and Abigail Miller each scored two points. Dundee's Matt Wood and Lily Hall competed at the Wayne-Finger Lakes Indoor Track Championship, Friday, Feb. 1. Wood claimed first in the 1600 meter race with a time of 4:48, a personal record. He also placed third in the 3200 meter (10:26.34). Hall took second in the long jump (15'7.5") and second in the triple jump (34'2.5"). Dundee's boys varsity basketball team lost a close game to Rochester Academy, Saturday, Feb. 2. The final score was 57-55. Austin Gibson scored 21 points and Isaac Semans 12. The Scots were beaten by Bloomfield, 74-40, Tuesday, Jan. 29. Gibson led with 23 points. The Dundee boys and girls varsity bowling teams both lost to Penn Yan, Tuesday, Jan. 29. The final score was 5-0. Connor Muck led the boys with a 660 total. Hunter Murphy posted a 580, while Stephan Smith had a 494. Ridge Wright added a 301 and Skye Strickland earned a 300. Mercedes Roy had a 407 series to lead the girls. Jaedyn Brewer earned a 397, followed by Kayla Andrews with a 396. Edele Morgan added a 360. Samantha Hunt scored a 331. HAMMONDSPORT--Hammondsport's girls varsity basketball team topped Belfast, 61-19, Friday, Feb. 1. Ana Salom led with 15 points, seven rebounds, three assists, and three blocks. Paula Garcia netted 10 points, with four rebounds. Shelby Sherman added nine points, six rebounds, and four assists. Jillian Underhill and McKenzie Boscoe both scored six points. Destiny Hammond contributed five points and six rebounds. Maddie Sprague earned four points, five rebounds, and three assists. The Lakers beat the Lady Scots, 46-24, Tuesday, Jan. 29. Hammond secured 10 points, seven rebounds, three blocks, and three steals. Salom earned eight points, eight rebounds, and three blocks, while Boscoe also had eight points and seven rebounds. Sherman netted five points, with four rebounds. Garcia and Tea Flynn both scored four points. Sprague contributed three points. Rorie Whitcomb and Underhill both posted two points. Hammondsport suffered a loss against Romulus, Monday, Jan. 28. The final score was 50-35. Flynn posted 10 points, 12 rebounds, and four assists. Boscoe added nine points and four rebounds. Hammond posted six points and four steals. Salom earned five points and three rebounds. Sprague scored three points, while Underhill had two points and nine rebounds. The Hammondsport boys varsity basketball team fell to Bradford, 51-43, in the last home game of the regular season, Friday, Feb. 1. Bradford maintained a lead at each quarter. For the Lakers, CJ Hill had 11 points, while Parker Watson earned eight points. Alex Davis netted three points. Nigel Snyder scored two. The Lakers beat Whitesville, Monday, Jan. 28, for their fifth consecutive win. The final score was 65-38. Watson led with 16 points and six steals. Michael Beam and Byron Stevens each had 10 points. PENN YAN--The Penn Yan Lady Mustangs beat Waterloo, 48-46, Saturday, Feb. 2. Ashley Sisson posted 12 points, with seven rebounds. Peyton Comfort added 11 points and four rebounds. Jenna Curbeau earned nine points, 12 rebounds, and three assists. Jammie Decker netted seven points, with nine rebounds. Hayley Andersen, Sierra Harrison, and Joddie Decker each scored three points. Decker also contributed six rebounds and four assists. 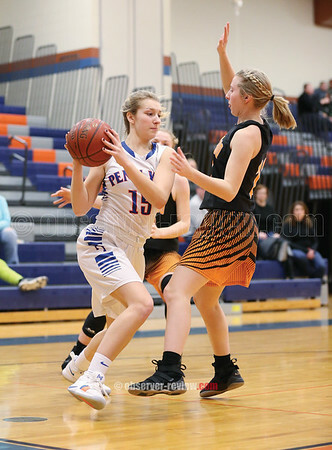 Penn Yan fell to Geneva, 52-42, Friday, Feb. 1. Harrison led with 17 points and five blocks. Comfort earned 10 points, six rebounds, and four assists. Sisson posted eight points and three rebounds. Curbeau had four points, seven rebounds, and three blocks. Jammie Decker contributed two points, while Joddie Decker posted one point, six assists, and four steals. The Mustangs' boys varsity basketball team won a close game against Geneva, 48-45, Friday, Feb. 1. Conner Fingar netted 11 points and was 5-for-6 at the free-throw line. Devon Gerhardt and Kyle Berna both scored seven points. Brennan Prather and Mason Kuver each earned six points, while Colton Smith added five. Peter Nicholson posted four points. Penn Yan lost to Waterloo, Tuesday, Jan. 29. The final score was 51-39. Berna and Smith both led with 10 points. Fingar and Kuver each scored six points. Kyler Lloyd added four points, while Gerhardt secured a three-point shot. The Penn Yan varsity bowling teams both defeated Dundee, 5-0, Tuesday, Jan. 29. Zach Gurba led with a 742. Cameron Bassage contributed a 614 series. Trenton Samatulski had a 605. Jon Mashewske posted a 557, followed by Connor Harmon with a 488. Kari Ayers earned a 597 for the girls. Brandee Ellis followed up with a 510 series. Emilie Thomas posted a 495. Rielly Stewart contributed a 439. Emily Augustine had a 425. The Mustangs boys and girls teams both topped Bloomfield, 5-0, Monday, Jan. 28. Mashewske led with a 616 series. Gurba earned a 601, followed by Bassage with a 592. Harmon added a 565. For the girls, Ayers had a 613. Ellis bowled a 598. Thomas posted a 553. Stewart contributed 339 in two games. The Marcus Whitman/Penn Yan varsity wrestling team took eighth at the Section V Class BBB championships, Friday, Feb. 1, and Saturday, Feb. 2. Justin Smith (132) and Jarred Calice (138) both were second in the championship round. Aiden Mowry (113) and Dylan Howell (152) took fourth. Charlie Burgess (138) finished fifth, while Evan Gray (120) placed sixth. WATKINS GLEN--The Watkins Glen boys basketball team defeated Newark Valley, Friday, Feb. 1. The final score was 64-33. Joe Chedzoy and Isaac McIlroy led the scoring with 18 and 15 points, respectively. The Senecas took the Interscholastic Athletic Conference division title with the win and move to 12-4. The Senecas' girls varsity basketball team fell to Newark Valley, 49-44, Friday, Feb. 1. Taylor Kelly and Danielle Leszyk both scored 12 points. Kelly also had five rebounds and three assists, while Leszyk added five rebounds. Kelsey Kernan contributed 10 points and three rebounds. Adrienna Solomon netted six points, with four rebounds. Hannah Morse earned four points, six assists, and four steals. With the loss, Watkins' record is 14-3. The Watkins girls lost to Waverly, Tuesday, Jan. 29. Aislinn Klemann netted nine points, all three-point shots, and had two rebounds. Kernan added six points and eight rebounds. Kelly posted seven points, four rebounds, and three assists. Solomon earned six points, with eight rebounds. Morse followed with six points, three rebounds, and three assists. The Watkins Glen boys varsity bowling team was fourth and the girls fifth in the Interscholastic Athletic Conference (IAC) tournament, Saturday, Feb. 2. The Senecas' H. Nathaniel Rose placed fifth individually. Three more of the Senecas' bowlers also placed. Wyatt Brower took 11th, with a high game of 257. For the girls, Hayley Cornish placed 14th. Nikole VanDyke was 16th. Both Rose and Vandyke were named to the second All-Star teams for finishing in the top 10 in the season's averages. The Watkins Glen girls varsity bowling team topped Newark Valley, 4-0, Friday, Feb. 1. VanDyke bowled a 544 series. Alyiah Clink-Bentley earned a 430, followed by Makenzie Kellogg with a 411. Brooke Usher posted 375. Nancy Jackson added a 369, while Cornish earned a 341. The boys lost, 4-0. Rose scored a 581 series. RJ Bannon contributed a 560. Wrett Brower bowled a 498. Wyatt Brower added a 454. Casen Weeden posted a 439. The Senecas' varsity bowling teams both fell to Waverly, Tuesday, Jan. 29. The boys lost, 3-1. Rose scored a 625. Wrett Brower followed with a 569. Bannon contributed a 561, while Wyatt Brower had a 525. Weeden earned a 505. The score for the girls was 4-0. Brooke Usher led with a 461, with Clink-Bentley posting a 460. Jackson and VanDyke both bowled a 458. Kellogg earned a 432. ODESSA--The Odessa-Montour boys varsity basketball team lost to Candor, 52-44, Friday, Feb. 1. Devon Mahaney netted nine points. Jared Rumsey, Derrick Lewis, and Paden Grover each scored eight points. Preston Lewis earned four points, while Deshawn Johnson added three. Ryan Griswold and Zach Elliott each posted two points. "It was a game of runs tonight. With both teams coming [in after] two days off due to weather, there were spurts of good basketball," said Coach Matt Johnston. "There were also spots where neither team could score and the game got sloppy. Their pressure hurt us in the second half. We turned the ball over way too many times at the end." Odessa-Montour's girls varsity basketball team defeated Candor, 52-26, Friday, Feb. 1. Alexis Saunders posted a season high of 17 points, with four steals. Olivia Grover also netted 17 points. Kennedey Heichel scored five points, followed by Sara Gardner and Jolynn Minnier each with four points. Kara Reese added three points. Hunter Daugherty had two points. With the win, the Indians' record is 11-5. The Odessa-Montour girls varsity bowling team took fourth, while the boys were 11th, in the Interscholastic Athletic Conference (IAC) bowling tournament, Saturday, Feb. 2. Jackie Vincent posted the highest series of all the girls with a 566. Taryn Hoyt had a 452. Jana Arias earned a 446, while Pixie Kinner had a 442 series. Sara Barr bowled a 364. Eric Rumsey led the boys with a 475. Six members of the combined Odessa-Montour/Watkins Glen varsity wrestling team will advance to sectionals, during the Section IV Division II qualifier event, Saturday, Feb. 2. Wrestlers who finished in the top eight places advanced to sectionals. Dylan Houseknecht (285) was second, facing Newark Valley's Trentyn Ruper in the finals. Josh Bravo (220) placed third. Collin Haag (145) took fourth. Andrew Hartford (126) was sixth. Josh Beckley (170) and Josiah Lynch (132) also qualified. The combined Odessa/Watkins wrestling team lost to Horseheads, 69-15, Tuesday, Jan. 29. Beckley (182) won by decision, 7-0. Bravo (220) and Houseknecht (285) won by forfeit.